LATEST HAPPENINGS IN & AROUND GREEK LIFE . . .
On behalf of the National Pan-Hellenic Council – Broward County Council, welcome to our website. The National Pan-Hellenic Council (NPHC) is the cooperative governing body of the traditionally African American fraternities and sororities, also known as the Divine Nine. The member organizations of the Divine Nine are Alpha Phi Alpha Fraternity, Inc., Alpha Kappa Alpha Sorority, Inc., Kappa Alpha Psi Fraternity, Inc., Omega Psi Phi Fraternity, Inc., Delta Sigma Theta Sorority, Inc., Phi Beta Sigma Fraternity, Inc., Zeta Phi Beta Sorority, Inc., Sigma Gamma Rho Sorority, Inc., and Iota Phi Theta Fraternity, Inc. Each of these groups evolved at a time when African Americans were denied essential rights and services afforded to others. Our organizations have a profound commitment to providing community service and helping to uplift public welfare and embrace the continuance of social actions, political empowerment and economic development. 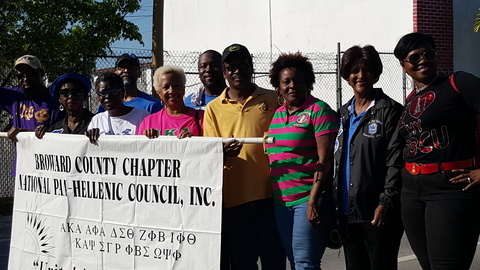 The NPHC – Broward County Council promotes interaction through forums, meetings and other mediums for the exchange of information and engages in cooperative programming and initiatives through various activities and functions. Please peruse our website in order to be informed of upcoming events and contact our member chapters.